These chambers can vary significantly in size, ranging from the size of a small closet to entire rooms. However, other than being larger than other chambers walk-in test chambers are essentially the same as any other environmental test chamber, and they can be designed and constructed to replicate the same kinds of conditions as other chambers. Environmental test chamber manufacturers typically fabricate a diverse range of walk-in chambers to accommodate the requirements of many different industries and applications. As with smaller test chambers, the most common walk-in test chambers are designed to test the effects of temperature extremes and a variety of humidity and moisture levels. Stability walk-in test chambers are another common type which are used to test shelf life, determine expiration dates, and to accelerate the process of aging in many types of products. Other walk-in test chambers include salt spray chambers, altitude chambers, vibration test chambers, and thermal shock chambers. 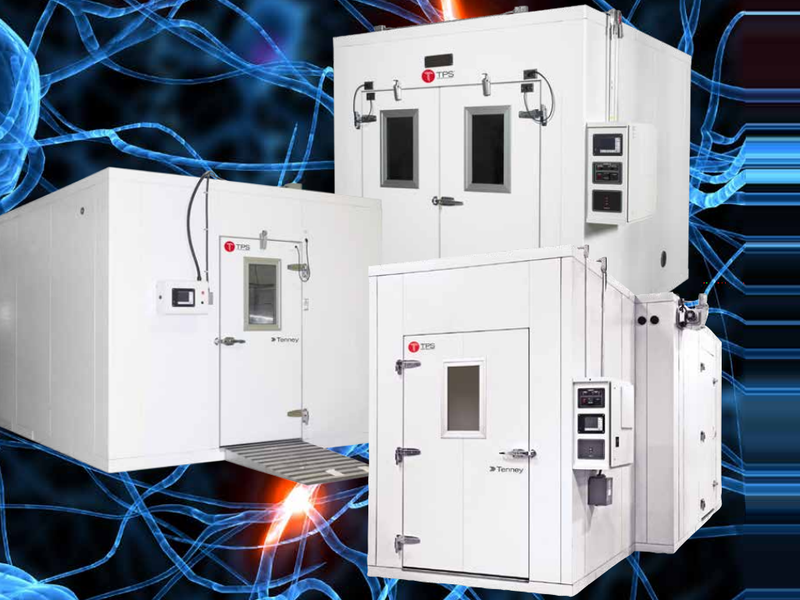 Walk-in test chambers provide manufacturers with the benefit of being able to test larger products and components, and they can also be used to test multiple smaller products at the same time. Some test chamber manufacturers even take this one step further by manufacturing drive-in test chambers. Like the name suggests, these test chambers are constructed to allow a variety of vehicles to drive into the chamber. These chambers vary in size even more significantly than the walk-in variety, accommodating anything from a small forklift to military vehicles and even aircraft. Regardless of the type or size of the test chamber, it is important to carefully consider the chamber design and construction to ensure that it can accommodate the desired conditions and meets accuracy requirements. However, due to the increased size of walk-in and drive-in chambers, it is even more important to make sure that the chamber is equipped to control and maintain the appropriate conditions without interference. Carefully controlled air flow must be achieved to maintain a constant temperature and humidity level throughout the entire chamber space. External influences should also be minimized, as these can significantly affect the results of environmental tests. The atmospheric temperature, moisture levels, pressure, and even small contaminants in the air can compromise the accuracy of environmental tests. For this reason, manufacturers must ensure that the chamber is properly sealed to eliminate these factors. While all these factors and many others can cause interference, it is important to know how much a given application depends on these factors. For some, these factors may prove incredibly important, while for others they may not contribute any significant impact. By working with test chamber manufacturers, you can determine which factors are most important to your applications and discuss the best methods and designs for controlling or eliminating them. Walk-In Test Chambers A walk-in test chamber is a type of environmental test chamber that is designed for testing or storing products that require a larger capacity space. These chambers were given this name simply because they are large enough for a person to walk inside.